The MAXG Coilovers utilize race proven inverted damper technology, producing an extremely strong damper, providing superior suspension geometry under heavy lateral and braking loads for both road and track applications. The large 44.5mm diameter damper bore delivers increased surface area loading, eliminating ‘bending’ during high impact loading that is associated with conventional dampers. Twin low friction bearing for improved support and system stability complete with an upper seal to eliminate the ingress of contaminants, providing system longevity. Precision machined & engineered inverted mono tube McPherson struts, 14mm diameter piston rod internally mounted with a 40mm diameter piston, utilizing hardened polished chromed low friction piston tubing, reduces damper stiction or motion breakaway. Improved damper body wall thickness controls strength vs heat dissipation, ensuring overall damper stability and consistency. The pinch clamp adjustable spring perch eliminates the spring perch from rotating if the locking nut is left loose. Fine thread pitch spring perch provides a ’finer’ level of height adjustment per turn than conventional dampers. High quality, European manufactured, chrome silicone springs ‘conditioned’ to ensure consistent spring rate parity and endurance. Spring perches built around a ‘racing industry’ standard racing spring size, providing greater chassis tuning customization. Long travel dampers allow sufficient open and closed length to ensure excellent bump and rebound travel, removing the likelihood of wheel lift and maintaining positive traction. 12 stage rebound adjustment system provides an increase in rebound damping force, delivering improvements in vehicle body motion without making the car overly stiff on compression. 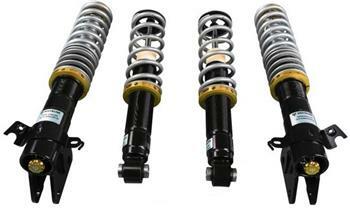 Perfect for everyday daily driver use and track racing utilizing the customized damper to spring rate ratio whilst providing the flexibility to handle mild changes in spring rates. Internal blow-off valve system ensures controlled ‘blow off’ during high velocity inputs removing any interference with the rebound adjustment. Provided with a specific spring perch adjustment tools eliminating the likelihood of adjuster slippage during the adjustment phase. The MAXG range is hand built in Europe using high quality precision machined steel components and decades of motorsport experience to ensure optimum performance and longevity.